Upcoming space shooter Galak-Z is a game that gives tingles to those of us who grew up in the '80s watching Robotech. And, even if you're a whippersnapper who didn't live through that stuff, you might still get excited. Take a good long look at this playthrough. Neat, huh? Jake Kazdal of dev studio 17-Bit did a live demo of Galak-Z yesterday on Twitch as part of the Extra Life charity marathon, showing off some of the tactics and environments that players will encounter in the in-development title. It may look like it owes a big debt to games like, say, Sinistar but it actually ups the ante, design wise. 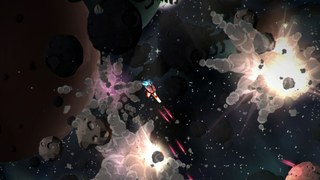 Galak-Z uses stealth and engagement mechanics like those seen in Far Cry 3. In the demo, Kazdal shows how its possible to lure enemies from other factions into fighting each other instead of you. And if you approach enemy patrols silently, you can totally can sneak up on them. Cool as it looks, it's the idea that really smart AI behaviors can live a retro-styled game like this that has me excited about Galak-Z.